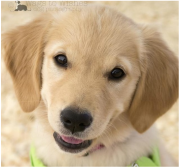 Abbey's road to the WoofJocks began at the tender age of 8 weeks, when she co-starred in our adorable spotlight-on-puppies segment. ​Since then, she's been diligently hitting the books, studying her obedience and agility lessons, in furtherance of her dream of becoming a core member of the next generation of WoofJocks. Aoife came to live with us this past spring. It was obvious from the start she liked to work! We starting training her in dock jumping and agility and as well as working on some special skills for the shows! She can often be seen in ball-der-dash being the ringer and often doing some goofy antics on stage! 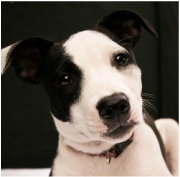 at home she loves to hike and play with the other dogs, she is a very social and loving dog all around! Argyle lives in the big city and enjoys running on the beach. His other favourite pastimes include eating, chasing squirrels and seagulls, eating, working closely with the cat to steal stuff (food mostly), eating and cuddling - not necessarily in that order! He has also appeared in a commercial for Humane Society International and even more recently - a music video! A perfect fit for a dog who loves to dance! 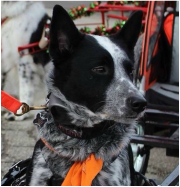 He has enjoyed playing agility since he was just a wee pup, and has been performing with the WoofJocks since 2011. Although he loves racing through tunnels, dancing and playing musical mats, Argyle will admit his favourite part of every show is meeting the audience at the end! Atomic Betty joins the WoofJocks Canine All Stars as the newest Pot Roast and her big brother, Captain Danger’s sidekick. 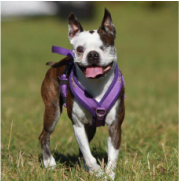 She’s full of fun, adventure and snorty tail wags for everyone she meets. When she’s not entertaining the crowds on stage, she’s filming commercials for Mattress Discounters, sleeping in sunspots and trying to convince the cat, Scrappy-Doo, that bulldogs are fun. The cat’s not convinced, but everyone else who meets her sure is! 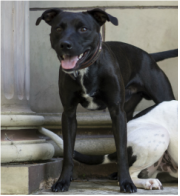 Aurora is a young sport dog who loves to play - disc, flyball, agility, dock diving, forest walk - as long as she can run and/or jump she is up for it. She is titled in Obedience (novice) and flyball, and this year will be starting disc freestyle. When she is not playing you can find her lying in the sun on the deck, or relaxing on the couch. Balance has starred in many commercials, print ads and a music video! “Mr.Obedient” loves to perform! 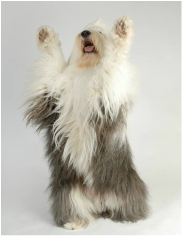 Bentley is an Old English Sheepdog and has been performing since he was 10 months old. He loves the enthusiasm of the crowd, and loves to meet and greet everyone. 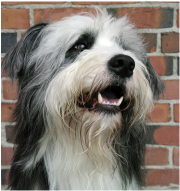 He has achieved his Obedience Trial Championship, Rally Excellent title and the Sheepdog Club of Canada Versatility Award. 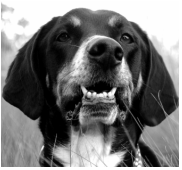 One of his greatest achievements was to be the first OES to earn a Canine Musical Freestyle title. He has started dock diving and his favourite pastime is running through tunnels and playing disc. He's a big dog, but thinks he's a lap dog. Birthday: Dec 16 2010. Best came as a puppy and was cute as heck! He is a loveable boy who always wants to make friends. Sometimes other dogs don't want to be friends but that doesn't stop him from trying to win them over! He especially loves puppies! 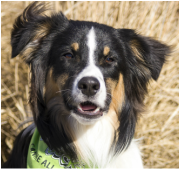 Best competes in Agility and flyball and knows lots of tricks! Best loves all creatures big and small, especially cats. Most cats don't like him, because who wants to be stared at for 24 hours straight! His favourite pastime is swimming and playing fetch. He is learning to put these together on the dock! Favourite WoofJock event is anytime he can run fast through tunnels! Interesting fact, Best has probably barked 10x in his whole life! If he had his way he would be outside 24/7. He loves the outdoors rain, snow or shine and always encourages me to get out and play! Blink was aptly named because of her speed. Blink and you will miss her. Blink is what you call a sport mix. She has a bit of everything great. Blink competes in Disc, Dock and Musical Freestyle. 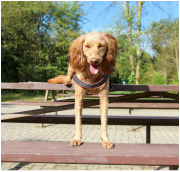 She is training in Agility, Flyball and Lure Coursing. At home Blink loves to sun bathe and chase squirrels in the back yard. 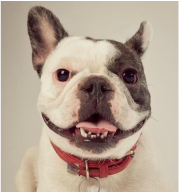 Blythe is a 3 year old French Bulldog who loves food, people, food, other people, food, other animals, other people, and lets not forget, food. Staying focused is not her strong point unless there is some sort of food involved. Blythe enjoys doing tricks, playing with her fur siblings, and skateboarding. She loves skateboarding and usually chooses to ride her way around the block instead of walking, since walking requires so much energy. 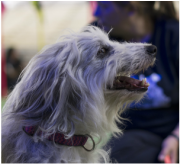 Blythe has been with the Woofjocks since the spring of 2015 and her favourite events include segments with agility equipment and tricks. This little man turned my world upside down! Buddy was my first sport dog. 6 1/2 inches and 2 1/2 lbs of endless possibilities, Buddy totally trusted me to keep him safe. Give Buddy a kiss and he will run any Agility Course! The more you cheer for Buddy the happier he is, so cheer on the Chihuahua! 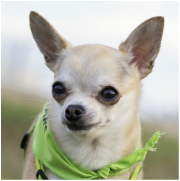 Buddy, along with his even tinier Chihuahua sister Miss Missy, is a certified therapy dog with St John's Ambulance! BULLET first performed with the WoofJocks Canine All Stars in the summer of 2014. 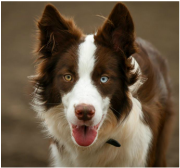 He is a Tri Colored Border Collie and he was very well named. Bullet is all business and loves agility more than anything else. Hates to be left out of anything and always the first to be in the car and will wait for hours in this spot so he doesn't get left behind. He loves to learn and tries so hard at everything he does. Although he is not much of a swimmer he loves going to the beach and running along the shore line. Pot Roast first performed with the WoofJocks Canine All Stars in 2012. 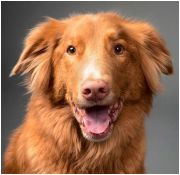 He started performing as a puppy at 8 weeks old: he was flown in from Edmonton, he got off the plane at Pearson in Toronto, was driven to the CNE and he was on stage in front of 1500 people that night schmoozing for the audience. He's a multi-talented dog who loves playing frisbee, flyball, swimming, obedience and sunspot hopping (a very competitive sport where he has to beat 5 other dogs to the sunspot, or casually push whoever was there first out of the way). He's also training as a hearing ear service dog. When he's not performing he's snuggling at home with his big brother Sea Monster or hanging out on the couch. His favourite food is everything. What Carl dislikes most is the annoying alarm clock in the morning... but when Carl finally decides it's time to get his day started, he has a ton of energy. 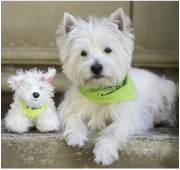 Carl enjoys long walks and, of course, agility but his secret pleasure is destroying stuffed toys! Carl recently starred in a music video, although he tries not to let the fame go to his head. 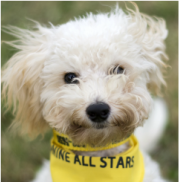 Carmel is a mini-golden doodle who loves to perform and compete in agility! 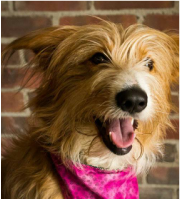 She loves to make people laugh and she loves all types of treats. When not walking and exploring she enjoys "sunbathing" in the sun. 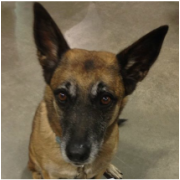 Carmella first performed with the WoofJocks Canine All Stars in the summer of 2014. Carmella loves to be running out on the farm to burn her energy playing fetch when she is not performing . 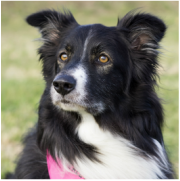 She competes in flyball, dock jumping and disc. Carmella is always honest, straightforward, very expressive and often she expresses her needs and feelings overwhelmingly so you can't ignore them. This is Chantilly (aka Shanti). We are so proud of this rescue; she has come a long way after a rough start to life. She made her début at the Zoomers Show in Toronto in 2013. She is a real sweetheart and she loves EVERYBODY. Her favourite things are bunnies and squirrels and wonders why we have none in the show. She likes events that involve running and jumping, but her favourite is the meet and greet with the audience. We are thankful to have her join our fur family - she is truly a gift. loves food, working - he is a very serious boy! Chloe is Millie's younger half sister. She enjoys all sorts of dog sports. 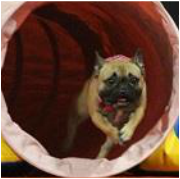 Chloe has trained and competed in agility. 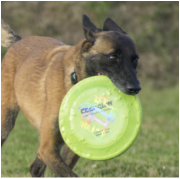 She competed as a micro dog in disc dog events and placed in her very first disc trial, as well as many trials thereafter. 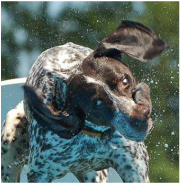 She has trained in flyball and loves swimming in pools. 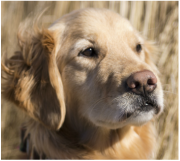 Chloe began doing shows with the Woofjocks in the spring of 2015 and has been retired from the show team since the winter of 2016 due to vision loss. She still comes out to cheer on her fur family and friends and to have some fun on the pitch between shows. Where do I even start? This happy, crazy, goofy dude started out as such a distracted guy. That is until he discovered the POOL! He earned his nickname "Super Cooper" the first time he jumped off the dock. He started flying right away and never looked back. He loves the water and is not afraid to tell everyone about it. 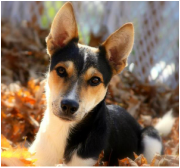 ​Cooper also enjoys disc, agility, and flyball. He is always up for an adventure or two, or three and will play all day if you are willing to keep the game going. He goes as hard as he can and is very happy to be included. Generous with his, get your whole face wet, kisses. Likes to cuddle up on your legs. Will happily help you finish your dinner and is an expert at opening pizza boxes. His siblings and Woofjocks teammates are Jesse and Max! ​Daisy was born July 19 2010. She has started agility classes and is learning the ropes so she can be a full time WoofJock like her big brother, Tumbleweed! The work horse of my crew! Protecter of his Chihuahua family (Buddy, Wii Willy and Miss Missy), friend to his brother LeeRoy, and of course Disc Dock and Carting Dog extraordinaire! Earl is a rescued Hound mix who adopted both Argyle and Jess back in November 2012. He has really been enjoying himself on his path to becoming a fully-fledged Woofjock over the past three years! He always dreamed of a family to call his own, but never could have imagined all of this fame and excitement! His favourite events during the show are the obedience drill and high jumping! He loves hearing the audience cheer, and adores meeting all the children after the shows... They're his favourite kind of people! In Earl's spare time he enjoys beach adventures, as well as hikes with his little (but older) brother and new even littler sister Tilley. He loves his sniffing for bunnies! He can also be a bit of a homebody, and loves nothing more than to stretch out his toes on his very own squishy sofa. Earl has two pet cats, and he claims his biggest pet peeve is when they try to cuddle up close! Silly cats. Electra is very loyal to her owner and loves to please. 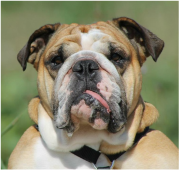 Electra is a very athletic and determined girl when she needs to get the job done as is typical of the breed, a very strong work ethic. 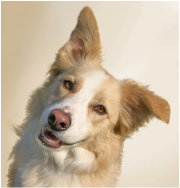 She plays flyball and has performed with the Woofjocks now for 2 years which she enjoys very much. Electra is one of their big high jumpers and pleases the crowd when this big dog gracefully leaps into her owners arms at the end of the steeplechase course. Emma is fellow WoofJocks member Molly's half sister but you wouldn't know it to look at them. Emma is a tiny Golden. But don't let her size fool you. She can steal a piece of food in the blink of an eye. 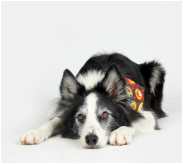 Emma joined the Woofjocks in 2011 and although she loves running through tunnels and over jumps, she's very happy performing obedience work too. 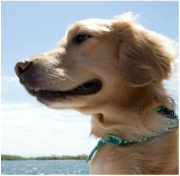 Along with her sister Molly, Emma also has a brother, a Golden rescue by the name of Charger! Express has been a steady dog in any sport. 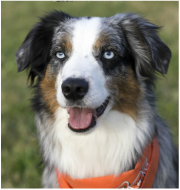 She has earned her Agility Master Championship, Obedience Trial Championship and Rally Excellent titles. She's not very big, but she's mighty. Her favorite pastime is playing ball, whether it's with her owner or by herself. When not playing, you will find her curled up in front of the fireplace. This little spitfire is a 20lb ball of fun! Fidget is new to the team and her big brother Rev is showing her the ropes. She was a shelter dog and so she has a lot of work ahead of her, she loves learning, she is quite the jumper and super fast! She is super sweet and loves attention. 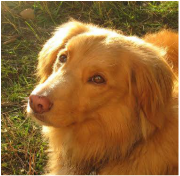 Her favourite past times are out-running her border collie brother, learning new tricks, playing ball and disc! Underdog to Wonderdog! 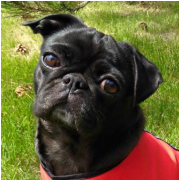 ﻿​Harlow is a saucy little black pug but don’t let her sweetness fool you... She’s pure Diva! 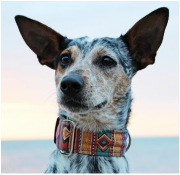 Harlow joined the WoofJocks in 2015 and has never looked back. 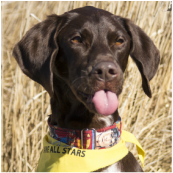 When not having fun with the WoofJocks, she is an active agility competitor and landed herself on the Agility Association of Canada (AAC) Top Dogs website finishing in 29th position overall in Canada with 100 Q’s (qualifying runs) and 10 Titles in 2015. She’s an awesome big sister to little brother T-Bone, (A.K.A. “The Boston”). 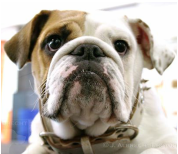 Harlow spends her leisure time wrestling with T-Bone, tugging and taking long walks along the lakeshore. She’s looking forward to another fun year performing/playing with the WoofJocks! 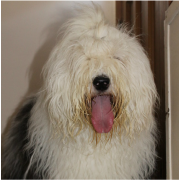 Hearts is an Old English Sheepdog and comes to us from Calgary. 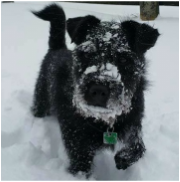 She loves the snow and cold weather. 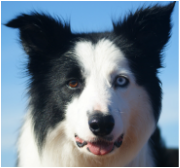 She is competing in obedience and loves to go herding ducks and sheep. She loves herding so much, she herds the dogs in the backyard. She is very eager to please. Hpnotiq - Nataki's In A Trance (Hip) is a Border Jack with lots of energy. 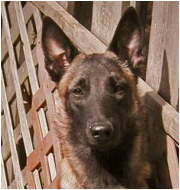 His favorite sport is Dock and Disc but he is also training Flyball, Agility,‎ Rally Obedience, and Musical freestyle.